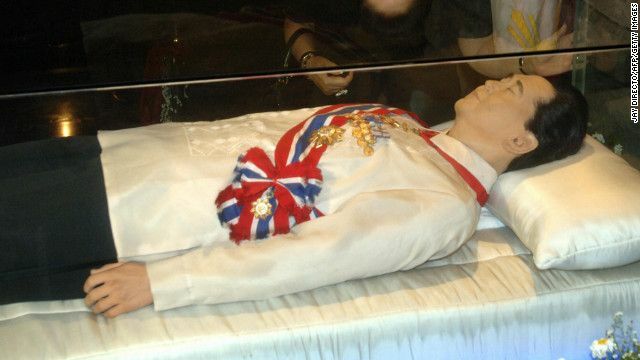 MANILA, Philippines - Yesterday night (10 June 2016), Sen. Ferdinand "Bongbong" Marcos Jr. said that the remains of his father, former President Ferdinand Marcos will likely be buried at the Libingan ng mga Bayani in September. Bongbong, was in Davao City to meet with President-elect Rodrigo Duterte and said the details have yet to be finalized except for the month, which happens to be the elder Marcos' birth month and the month that he declared martial law in 1972. In late May, Duterte said he would allow Marcos' remains to be buried at the Libingan ng mga Bayani, a move that was met by opposition from netizens, civil society groups and outgoing President Benigno "Noynoy" Aquino III, who said the late dictator did not deserve the honor. The Human Rights Victims Claims Board, validates and processes reparation claims for victims of rights abuses under the Marcos regime, has received more than 75,000 applications. Valid claimants will be paid from P10 billion awarded to the Philippine government from ill-gotten wealth in a Swiss account owned by the elder Marcos.